The following is an excerpt from the free, on-line lab manual used in the introductory cell biology course at Cal Poly (see the Resources section). This story was inspired by Martina Bremer, a Statistician at San Jose State University (She's not a a watch thief! She introduced me to the idea of the chi-square test being like a trial.) I think this example is effective in helping students think about the null hypothesis and the concept of significance. null hypothesis (H0) = The suspect is innocent. The prosecutor will present evidence against the null hypothesis (i.e. trying to show that the suspect is guilty). The jury will decide if the evidence against the suspect is significant. Let's say a robbery has taken place at a fancy store…a jewel-encrusted Piaget watch has been stolen! Soon after, a suspect is arrested and brought to court. The evidence against him is simple; when the police found him he was WEARING a jewel-encrusted Piaget watch! The jury must consider this question…What is the chance that this person is innocent (the null hypothesis is true) given that he was wearing a jewel-encrusted Piaget watch? But what if, in this particular town, 75% of people were walking around wearing jewel-encrusted Piaget watches. Now the case against the suspect isn't very strong. The fact that he was found wearing a jewel-encrusted Piaget watch is nonsignificant. Saying it another way…there is a 75% chance that the suspect is innocent and wearing a Jewel-encrusted Piaget watch just by coincidence! The jury would most likely NOT reject the null hypothesis and find the suspect not guilty. Put yourself on that jury…at what point would you be comfortable rejecting the null hypothesis and convicting the suspect? 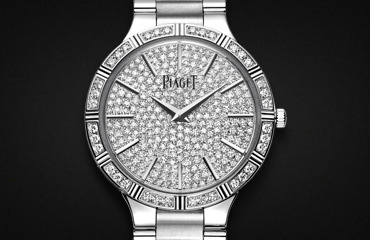 What if 10% of people in the town wore jewel-encrusted Piaget watches? What about 1%? At what point would the evidence (the suspect was wearing a watch) become significant? In part 2 of this post I'll provide some examples I like for introducing the chi-square calculations. Thanks for reading! It's finals week here at Cal Poly so I've got a short post. 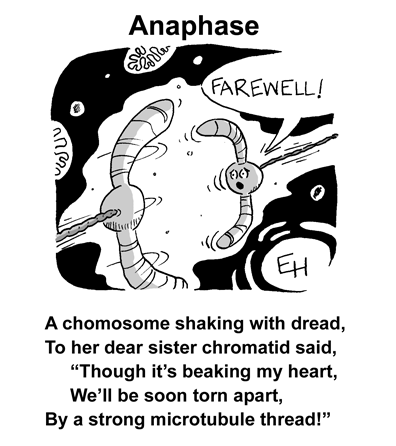 This is one of my most frequently-viewed cartoons. It's also one of my first (drawn in 1998). There are some recognizable organelles and molecules in the background...a mitochondria, a ribosome associated with an mRNA. 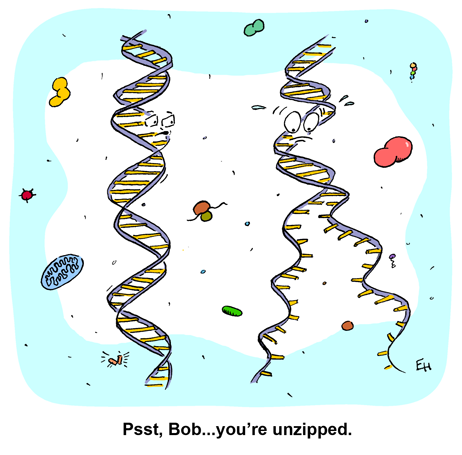 As far as classroom uses go this cartoon could be used to reinforce that the hydrogen bonds that hold two single strands of DNA together are relatively weak and under normal cellular conditions will undergo temporary dissociation. The following picture is part of an ad that ran in McCall's Magazine in 1971. Weird models...right? But beyond that, the ad raises some questions. What do they mean by "strong"? 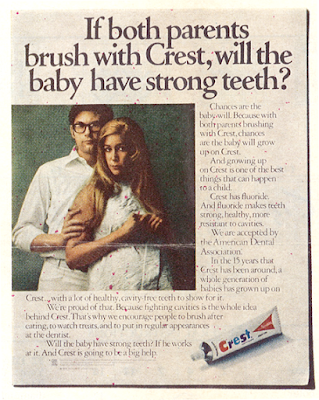 (Does brushing make teeth strong or does it help keep strong teeth healthy?) Are they suggesting that the parents brushing behavior can influence the traits of their child? Alice: Yes...strong teeth is something a child will inherit from the parents. Bobby: Yes...brushing your teeth makes the teeth stronger so parents who brush will pass strong teeth on to their child. Camille: No...Only DNA is passed from parent to child and brushing your teeth doesn't affect your DNA. Dominique: Yes...if the parents brush their teeth the child is more likely to brush giving the child stronger teeth. Which student do you agree with the most? Why? Bobby's answer is the weakest. It demonstrates a common misconception that traits acquired during one's lifetime can be passed to offspring. This idea is attributed to the French naturalist, Lamark. Alice's answer is true, characteristics like tooth shape and tooth enamel are inherited. However, Alice's answer doesn't address the effect of brushing. Camille and Dominique both have accurate answers. As Camille says, tooth brushing doesn't effect DNA and therefore, can't be an inherited trait. Dominique looks at it differently focusing on the ability of the behavior of the parents to influence the behavior of the child. 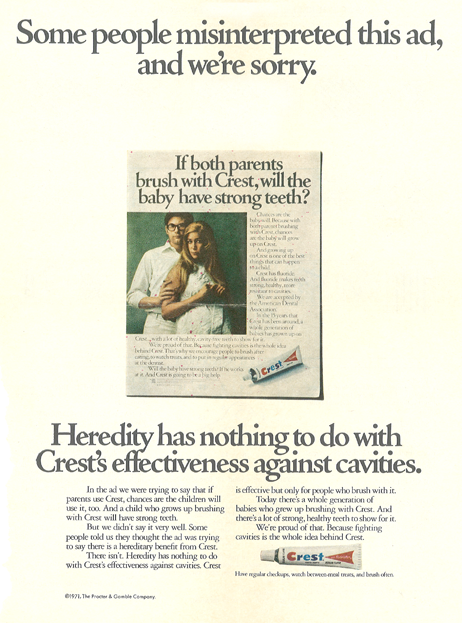 If the focus is on behavior then yes, it seems reasonable that parental brushing will promote good dental care in the child. Here's the full ad. I think it's safe to assume that many people were confused by this ad and assumed that it was promoting a Lamarkian viewpoint. As the ad writers tell it, "In the ad we were trying to say that if the parents use Crest, chances are the child will use it too." Then they add "But we didn't say it very well." Thanks! And keep brushing after every meal.